I have been doing some independent research in the effort to determine the size of the Galactica. 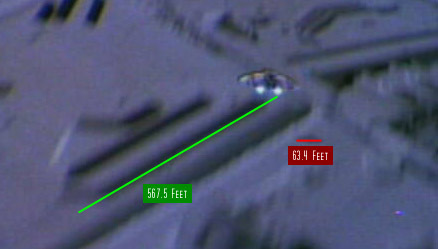 There are basically three camps on this issue, one that says the Galactica is 2000 feet long, one that says it is 6080 feet long, and one that says 2-3 miles long. My original intent was to present evidence that the 6080 measurement is the correct one but after doing the research I've come across some interesting measurements. I now intend to present all my research in an unbiased manner and let you, the reader, decide what you want to believe. 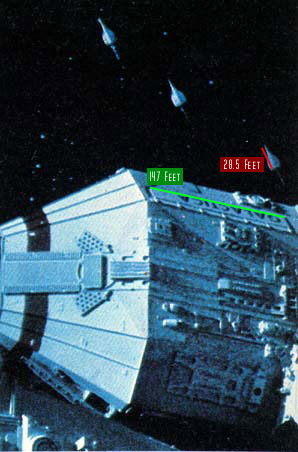 2000 ft - This measurement comes from an article from Starlog, August 1978, by Richard Meyers who supposedly got the number from the production staff. The British BSG Annual in 1979 also has this figure contained in the article. This size is also stated on the Revell/Monagram model kit. I don't have access to these articles (but I do have the model kit) in order to give an exact quote but I will trust the sources I got this information from. 6080 ft - This measurement comes from an article in a British magazine by one of the three owners of the Galactica Archives and estimated the scale of the model to be about 1/960 scale (1 inch = 80 ft). This measurement is roughly supported by Glen Larson (Producer) and John Dykstra (VFX supervisor) who say the ship is about a mile in length. The extra material on the DVD also says the ship is a mile long. This measurement is exactly one nautical mile. Again I don't have the article and will trust this scale was stated. In the magazine Science Fantasy (October 1978) James Burns writes "The 'Galactica', which is supposed to be two to three miles long, has been built down to scale..."
In a related note and one that I will use eventually to do some measurements, The Battlestar Galactica Scrapbook mentions that Dykstra's team extrapolated the length of a the shuttle from the size of the windows to be 110 feet. For practical purposes, the art director arbitrarily cut the scale in half and a 33 foot long section of the shuttle was built. 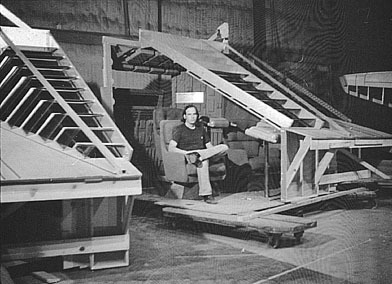 The full scale mock-up of the Viper was 28.5 feet long, however this mock-up is proportionally shorter than the filming miniature. I currently don't have any information as to the difference but in the visual effects shots, the Viper should normally be considered to be longer. For these measurements I will be using the 28.5 foot length however. I've been scruitinizing many of the episodes to find images that can be used to calculate the scale of the Galactica. 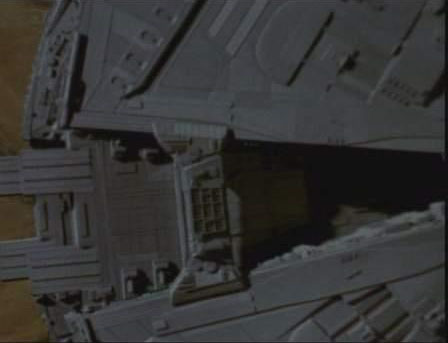 The only images that can be used are those that show both the Galactica and something we know the size of. Though this image is blurry, it is the only picture I have been able to find that was taken from a position far away and directly at the side of the ship. The camera being being far away is important because it suffers less from lens distortion and perspective problems. This will cause some minor inaccuracy in my measurements but overall it won't significantly affect the outcome of the measurements. This picture is also important because this is of the actual studio model. I am also using Jim Creveling's model as reference and while it is very impressive, I think I have found some discrepencies when comparing it to the studio model that could throw off my data. 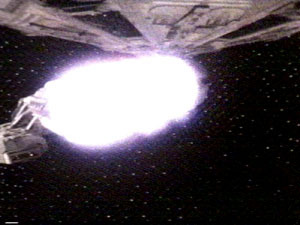 This is a picture we commonly see when a ship is about to enter the landing bay. The model makers stuck in a picture of vipers inside the bay and the depths of the bay going off in the distance in perspective to give the illusion of depth. Since the official length of a viper is 28.5 feet, we can fairly easily compare that length to the dimensions of the landing bay opening and from there measure the full length of the Galactica. 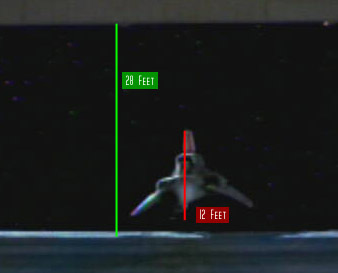 This measurement also seems to be supported by this still taken as a viper lands. I made sure to grab this picture right when the shadow crosses the ship so we know where it is in relation to the opening. Using Jim Creveling's model, and the measurements in the previous picture, we get a width of 1672 feet. 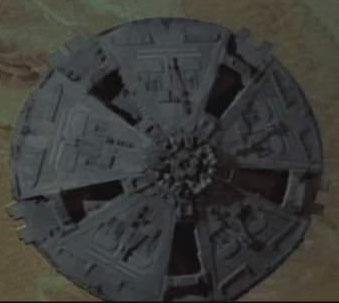 Since we know the model's dimensions were 76" long, 30.5" wide and 11.5" tall (information acquired from the wonderful page Sheba's Galaxy) the total length of the Galactica comes to 4166 feet. Here is a picture of a viper traveling down the launch tube. You'll note that while the ribs are triangular, the overall tube actually is circular. Using measurements from "The Official Battlestar Galactica Blueprints" by Today Press I've roughly measured the tube to be about 16 feet in diameter. From the outside, we can see the exit points of these tubes on the side of the Galactica. Using that 16 foot measurement, I compare it to an easily visible piece of detail, in this case the red lines above the tube. From these red lines, we can get the total length of the landing bay. And finally derive the total length of the Galactica. In this case, 4143 feet. 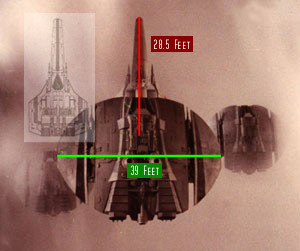 Taking a measurement again from "The Official Battlestar Galactica Blueprints" of the width of the cockpit window of a raider at its widest point (11.6 feet) I calculated the total width of a raider to be 63.4 feet. Unfortunately, this measurement isn't really supported in this picture because of the size of the Viper so I will have to figure out a different way of calculating the size. Here's a curious bit of measurement. 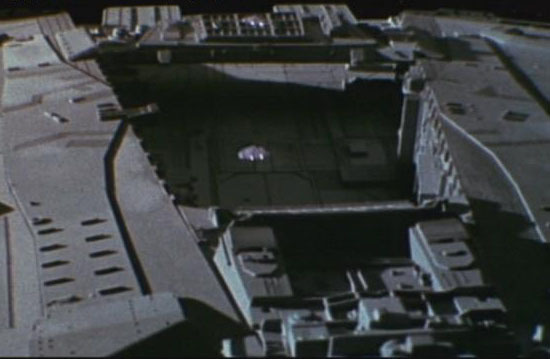 I noticed the visual effects artists had put in a shadow under this raider as it passes over the Galactica. Since the light source is a great distance away the size of the shadow should be, for all intents and purposes, the same size as the raider. As an interesting note, after I found this shadow and did these measurements, I was doing more research for this page and came across an interview with Dennis Muren in a science fantasy interview where he mentions putting this shadow in. Again, comparing to detail visible in the scene. In this case using the 63.4 Foot measurement. In this case using the 39 Foot measurement. A 35 foot measurement would yeild a total width of 5148 Feet. 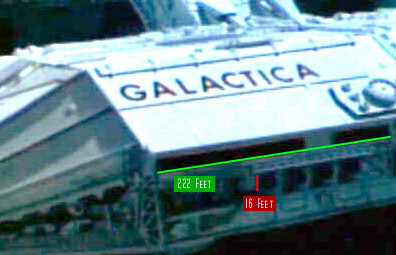 I calculate the width of the Galactica to be about 8985 feet wide yeilding a total length of 21,210 feet using the 63.4 foot Raider. I calculate the width of the Galactica to be about 5735 feet wide yeilding a total length of 14,290 feet using the 39 foot Raider. A 35 foot raider would yeild a length of 12,818 feet. In this example, I calculate a length of 2712 feet. Like all sci-fi shows, this one suffers from "ships changing size in every shot" syndrome. This usually has to do with the difficulty of putting two miniatures that are built in different scales into the same shot. It also has to do with the fact that most people involved in the industry don't really care if continuity is maintained because what is important is the final look of the film and the composition of the shots. Effects such as these are not suited to this kind of scrutiny and obviously don't hold up to technical specifications. This section will be updated once I make size measurements like those in the pictures above. Comparing the size of the raider as they launch from the Base Star, I calculate the width between the inter corners of the bridge where it meets the trench to be about 14.4 raider widths. Using that as a basis and comparing that width to the full diameter of the Base Star I come up with a diameter of 126 raider widths. At 45 feet wide (using the other reference photos above I come up with this approximate value) I calculate the diameter of a Base Star at 5670 feet. Much smaller than my initial calculation but I think this is more accurate. I double checked my calculations and this time measured 132 raider widths giving a diameter of 5940 feet using the above method. I think it's safe to say Base Stars are somewhere in the ball park of 5800 feet in diameter if 45 feet is an accurate width of a Raider. New Images! 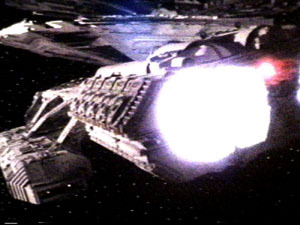 The images below were sent to me by Mike Carlson and apparently came from the movie Mission Galacitca: The Cylon Attack. I had never seen this movie since I've always heard it was just a chopped together version of several episodes the main ones being The Living Legend I and II... I guess I was misinformed and I'm now looking to get a copy. Anyway, these images certainly change my ideas as to the size comparisons between the Battlestar and Base Star.